Crowne Peel-N-Stick White Foam Board has a pressure-sensitive self-adhesive surface on one side for mounting posters, prints, layouts and virtually any type of artwork, providing a neat alternative to messy sprays. Peel away the easy release protective liner and the adhesive permits some repositioning to ensure that a smooth bond is achieved. Applying firm, uniform pressure permanently bonds the artwork to the mounting substrate. 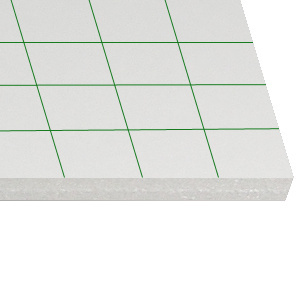 Crowne Peel-N-Stick white foam board is available in 3/16" thickness in a full range of sheet sizes in high tack adhesive permanent strengths. Available in case quantities only. Release sheet has a grid for easy sizing.